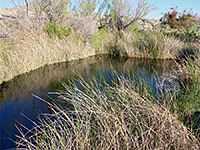 Ash Meadows is an unusual and extensive wetland region of springs, seeps, reservoirs, marshes, ditches and streams at the lower end of the Amargosa Valley, for most of the year a very hot and dry area near the north edge of the Mojave Desert. 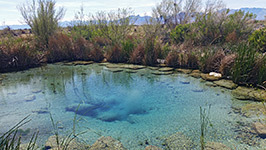 The wetlands are just nine miles from Death Valley Junction, near the southeast entrance to Death Valley National Park and include a small isolated section of the park containing Devils Hole, a flooded cave entrance which provides the only remaining habitat for an endangered species of pupfish. The meadows are protected as a national wildlife refuge, principally for the many types of birds found there, but they also support fish, lizards and mammals, and provide the sole US habit for no fewer than 25 species. Endemic plants include spring-loving centaury, Ash Meadows blazing star and Ash Meadows sunray. 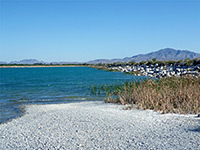 There are approximately 40 springs spread over the 22,000 acres of the reserve - the majority are pretty pools of clear bluish water, plus one permanent area of deep water - Crystal Reservoir, which although not especially attractive is bordered by flat beaches, and is a good place to spend a couple of hours on a warm spring day. The refuge is not much visited, despite the relatively good roads, the proximity of some of the springs, and the informative visitor center. There are many quiet side tracks that would be ideal for primitive camping, though this activity is not permitted; the nearest suitable places are along Bell Vista Road a few miles southeast. 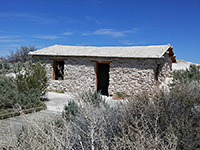 The main (west) entrance to Ash Meadows National Wildlife Refuge is just a couple of miles from the California stateline, close to NV 373/CA 127, reached by a paved side road off to the east. The approach is rather unpromising, across scrubland mixed with mud/salt flats, sand dunes and scattered, dry-looking bushes. The road is quite straight and once inside the refuge becomes unpaved and dusty, and often rather uneven. Other tracks branch off at right angles leading to reservoirs and springs, of which the closest and most visited is Crystal Spring, next to the refuge headquarters and information center. A 0.9 mile boardwalk partial loop trail follows a small reed-filled stream, a narrow strip of greenery in the surrounding arid terrain, to its source at an unexpectedly beautiful spring - a pool of clear, blue-green water several feet deep and about 40 feet across, often with ducks and other birds in residence. Like most in the area the spring has a white sandy floor and is lined by bright green algae, somewhat reminiscent of the enticing hot pools of Yellowstone National Park in Wyoming. The other springs of Ash Meadows are spread over several miles of the whitish alkali desert, together with two reservoirs (Crystal and Peterson, this latter usually filled with reeds rather than water), and several marshes, these towards the southwest side of the refuge. There are three other large springs that are signed from the roads and have developed viewing areas. 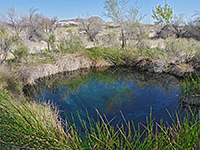 Point of Rocks Springs consist of several sparkling pools enclosed by trees and bushes, at the base of exposed, cacti-covered limestone terraces near the east side of the refuge; the largest is named Kings Pool. Rodgers Spring is a deep, clear pool in open surroundings towards the north edge of the refuge, while Longstreet Spring, close by to the south, is similar in appearance though just a little more overgrown, and produces a sizeable stream of fast-flowing water, gushing away to the west. Nearby is a historic stone cabin, built by Jack Longstreet in 1895. Other pools include Fairbanks Spring, reached by a 1.5 mile trail from the end of the road at Rogers Spring, Bradford Spring, in a patch of woods at the junction of Point of Rocks Road, and Big Spring, along a rougher road in the southeast. In the northeast corner of Ash Meadows National Wildlife Refuge, at the base of a range of barren hills, lies Devils Hole, officially part of Death Valley National Park. 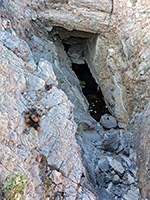 The hole is a sheer-sided cavity in the rocks about 30 feet deep and forms the entrance to a flooded cave system, but is not very interesting to look at and not so well signposted, perhaps as tourists are not really meant to visit. The site contains scientific monitoring equipment and is enclosed by a high security fence to prevent anyone disturbing the endangered Devils Hole pupfish that inhabit the murky waters below - their population fluctuates between about 500 in summer and 200 in winter. The pupfish exist only in eight very isolated pockets of moisture in the Mojave Desert, remnants of much wetter times long gone, and all are now endangered. It is rather sad to think that this one species lives only in this dull, algae-filled pool at the bottom of a hole in a dusty, unknown part of the desert. 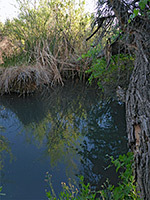 Two other pupfish species are also endemic to the reserve.